Bald eagles don't have to be fast, only strong. The majority of their diet is either fish or stuff already dead, competing in the latter situation with vultures, ravens and crows. Adults weigh 9-13 pounds (females are larger than males), and can easily lift a 3-5 pound fish out of the water. 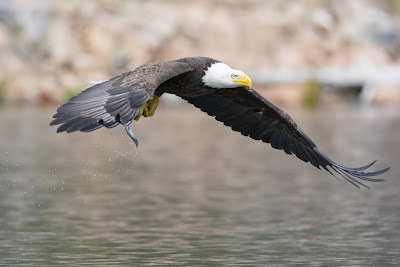 An eagle that ends up in the water - perhaps after grasping a too-large fish - can take off from the water's surface. Bald eagles also prey on young Canada geese, ducks and small mammals. And steal food from other predators, such as ospreys. Bald eagles are in the genus Haliaeetus, common name sea eagles, of which the Steller's Sea Eagle* is the largest. Of the some 60 eagle species worldwide, our bald eagle does not make the top five for weight or wingspan. All eagle species are long-lived. For the bald eagle, lifespan in the wild often exceeds 20 years. In captivity, lifespan has been known to exceed 50 years. According to the Commonwealth of Massachusetts, there were 56 nesting pairs of eagles in the state in 2016, up from 51 the year before. The process of restoring eagles to this state began in 1982. Over a six year period, 41 eagle chicks were collected in Canada and released in the Quabbin Reservoir area. The chicks fledged, i.e., reached flying age, at 11 to 12 weeks. Most survived the next critical period of six weeks during which hunting, flying (and landing) skills were improving. In a normal situation the young chicks would have been fed every 4 to 5 hours by their parents, but in this relocation program the human caregivers wore a hand puppet that looked like an adult eagle's head. 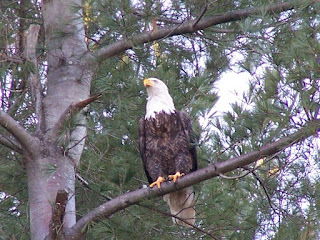 The effort to restore eagles to Massachusetts was part of the federally funded Northern States Bald Eagle Recovery Plan. The effort worked. 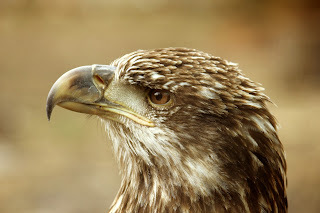 Young eagles take four to five years to reach sexually mature adulthood, including a slow transition from juvenile all-brown tones to adult coloration, during which time they wander hundred of miles but tend to return to the general area where they were born to seek a mate and start raising families. By 1989 the relocated eagles were starting to nest in the Quabbin region. Since then, nesting sites have been spreading east and west. The nearest to us is in Framingham. Any local eagle sightings are of wanderers - either juveniles that have not yet paired up or adults during the non-nesting part of the year, which runs from mid-July to mid-January. Lead poisoning continues to be an issue. The most significant hazard to wildlife is through direct ingestion of spent lead shot and bullets, lost fishing sinkers, or through consumption of prey containing lead shot or bullet fragments. While lead was federally banned for waterfowl hunting in 1991, its use in ammunition for other hunting remains widespread. In the woods, I heard a scream. I do not know, I only heard. After midnight I heard a scream. I was awake, it was no dream. Or prey of bird I could not say. I never heard that sound by day. *Steller's Sea Eagle: Georg Wilhelm Steller (1709-1946) was a naturalist on a Russian expedition to the Bering Sea in 1740. This eagle is 1.5 times the weight of the bald eagle. Adult females are known to top 20 pounds. Diet is mostly fish. In addition to the sea eagle, other species bearing his name are the Steller's Jay, Steller's Sea Lion, and Steller's Sea Cow. The last, a relative of manatees and dugongs, was hunted to extinction within decades after Steller's identification of the species. **The Golden Eagle is native to North America, but unlike the Bald Eagle, not limited to North America. 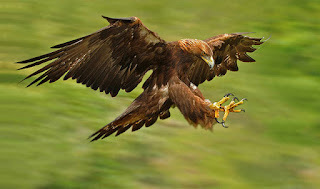 Golden Eagles prey primarily on small mammals, and prefer open plains and mountains to densely wooded terrain. But they do wander east as far as Massachusetts, and can be mistaken for immature Bald Eagles. 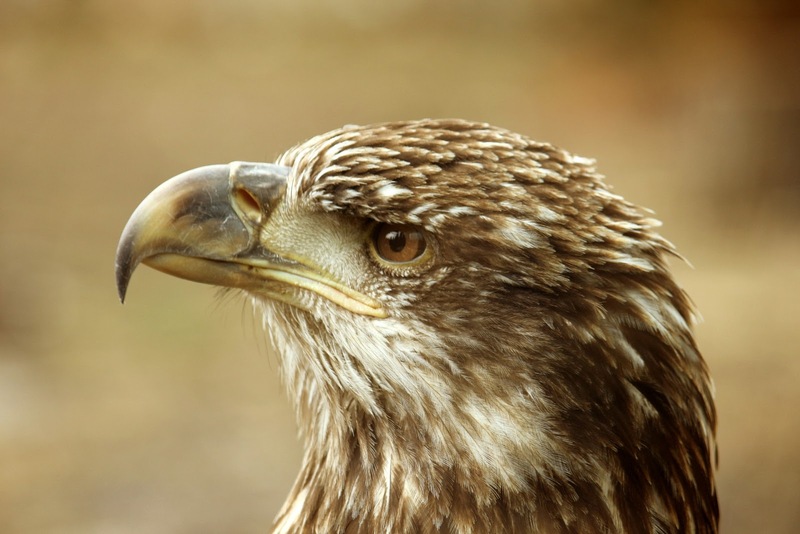 The original federal Act (1940) protected only Bald Eagles, but was extended to cover Golden Eagles in 1962. Wolves Repopulate Massachusetts - NOT!